Gaianar is setting, system and huge bulk of tech-and-fantasy resources. A system so crunchy you'll lose enough teeth on your first bite to warrant mortgaging your Grandma. Set long after a spiritualised apocalypse, where fantasy has crept in over the top of long ruined cities; producing a world like Earth with magic, technology, robots, psyonics and much, much more. There isn't enough time in a couple of evenings to review World of Gaianar in detail. There isn't enough time in a couple of weeks to review Gaianar in totality. 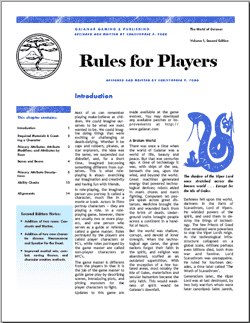 This review concentrates on the player's handbook, which details Character Creation and much of the rules. The world book itself is available as a d20 Setting book too, so grab that for a quick fix (downloads section on the Website). Gaianar is set long-post-apocalypse where a fantasy world has grown out of the ashes of a great human civilisation. Ruined cities thrust out of the undergrowth. There is gunpowder and steam but also magic and swords. The system described below weaves these disparate themes together. Which isn't easy. Character creation is involved, you won't be able to date it casually, you'll find yourself being married to it by Elvis in Vegas. The nebulous volume of rules, possibilities and themes means that the combinatorial possibilities are immense. Some believe that Lite games are the epitome of freedom as they specify very little. I think that it can be beneficial to have the ideas written in front of you to jolt the creative juices. And there is plenty of charge in that jolt. The first pace on this Frodo-esque journey is choosing a race from Human, Elf, Dwarf, Changeling or Fey. Then roll (or use the point system) for abilities (Strength, Intelligence, Wisdom, Constitution, Dexterity, Charisma, Comeliness, Faith). Optionally, you can add a Bane or Boon, which are randomly rolled negative/positive affects. I do like these systems (I call them Psychotheatrics in Icar) because the random selection makes the character feel less analytical and more like an accident of nature. Like my players, each an accident of nature. There is a high level of detail regarding what the attribute values mean. Such as the probability of bending a one inch bar of steel for each level of the Strength Attribute. Faith is a powerful ability: have a high value and you're generally more useful around the planet, a low score suggests that you've a career in fast food tavern table sanitation. From these abilities, you derive a series of secondary statistics that government more aspects of your character. Next is alignments and there's no surprise here: Good / Neutral / Evil. On top of that, there's also Structure or Randomness. If you're structured then you like your world to be ordered and apply your alignment consistently. If your alignment is random then you apply your alignment inconsistently. My players are random. Just random. GMing them is lot like trying to juggle water. Each race is explained in detail and has a number of provisos and some have their own rules. For example, Constructs are a race of slaved machines (robotic knights in armour) that sometimes awake to become their own beings. You can also play a Wereworlf, Werecat or Werebear. I had to stop writing this when I read 'Werebear' and cry with laughter. It struck me as the Care Bear that was the centre of a particularly dark necromantic unaired episode that lead to the sacking of a disturbed animator. 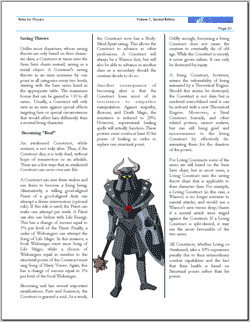 Character classes each have their own sets of rules, giving bonuses in play and the is a bewildering mix. You could end up with a party consisting of a Mathematician, Barbarian, Shaman, Gunslinger and Necromancer. Multiclass characters are also dealt with - imagine a Barbarian Mathematician? Can you do that? If you can, can you draw that? There are skills, languages, you roll dice for your hit points and saving throws. Innate powers give you a supernatural ability and classes have levels, which are gained by experience. Gaianar bristles with more mechanics than a degree in Engineering. There are six forms of combat Melee, Missile, Spirit, Empathic, Ship and Flight. Each with their own laws! Generally, you work out initiative and then take it in turns to attack someone else. 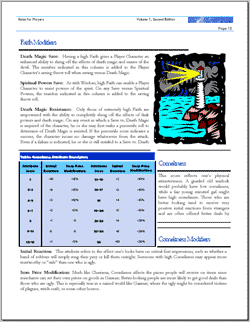 Rules for single combat or party combat are included. There is armour class and a host of modifiers. Saving throws allow you to avoid taking damage. Your character can go mad, or pick up a series of mental illnesses. All described in detail. If you're aufait with early incarnations of D&D (I'm not), you'll recognise a lot of the facets. Two Hundred and Twenty Five Pages? Christopher is the Prince, no King, no The Emperor of tables. I've see some cracking tables in my time but Christopher takes Gold. Need someone cremated? It's on the 'Services while travelling' table. Buy some finger bells? On the musical instruments table. Everything is in tables. 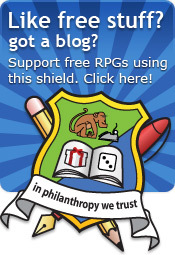 I'm surprised there isn't a table listing RPG Bloggers. This makes the book quite large at 225 pages. This does include a big list of skill proficiencies, which are listed last. There are hints throughout for the GM but no specific section. Most game designers walk a fine line between too much ruling and too little. Christopher ignored the line and plunged into the abyss of ruling. No area of life is left without rules and a table. It would benefit from reading my Guide as the order can be a little confusing. The layout is satisfactory but suffers from random font changing - size, weight and type. Some of the tables are the printing Antichrist - black text on dark purple background. I spotted a few sentences ending abruptly and the layout squeezes the text into chunks that disturbs the flow. None of this dreadful but might put some off. Also, delightfully, easy things to fix. Let's hope Christopher has the inclination to do so. Gaianar is a huge work. Christopher expelled enormous energy and thought to create it. Nought omitted. The gargantuan weight of rules is an acquired taste. Not to mine but I have chatted to many that delight in a system with plenty of red meat. The setting of tech-and-fantasy has a slightly uncomfortable gait, as if wearing a different shoe on each foot but it is that which makes ideas fizz in and out of existence. It's different to anything else I've read. Gaianar, either as a Setting or a combined System-Setting has plenty for the avid gamer who is utterly fed up with me reviewing Lite games!